A federal judge ordered Martha Stewart on Tuesday to surrender for prison by Oct. 8, granting the celebrity homemaker's request to begin serving her sentence for lying about a stock sale. The judge also recommended that U.S. prison officials assign Stewart to a prison camp in Danbury, Conn., or Coleman, Fla. — the two she requested last week. She prefers the minimum-security facility in Connecticut, close to Stewart's home in Westport. "put this nightmare behind me and get on with my life." The millionaire businesswoman was sentenced in July to five months in prison and five months of house arrest after she was convicted of lying about a stock sale. The 63-year-old Stewart will do five months in a federal prison — likely getting out early next year — followed by five months of house arrest. A federal judge allowed her to stay out of prison while she pursued an appeal, but Stewart asked to serve her time anyway. She said she wanted to get the matter behind her and her company, Martha Stewart Living Omnimedia Inc.
"I must reclaim my good life," she said. Stewart said last week she would miss her two dogs and seven cats, and hoped to be back home in time for the spring planting. Starting her sentence next month would place her release in early March. After the five-month term, Stewart still must serve five months of house arrest. Cedarbaum's decision came one day before Larry Stewart, an ink expert who testified for the government at the trial, is set to go on trial himself on charges that he lied repeatedly during his testimony. Stewart's appeals attorney, Walter Dellinger, said he still believed she had a chance to win a reversal of her conviction; the attorney had asked a federal judge to withdraw the stay of her sentencing pending appeal. Stewart, who had promised immediately after her conviction to battle to prove her innocence, had recently appeared resigned to swapping her expansive suburban home for a jail cell. After her July sentencing, Stewart said she would have no problem doing the time. "I could do it," she said in an interview with ABC. "I'm a really good camper. ... There are many, many good people who have gone to prison. Look at Nelson Mandela." Stewart also said in July that was considering serving her sentence just to put the matter behind her and her company. "This is not a surprise," said CBSNews.com Legal Analyst Andrew Cohen last week. "Really it makes a lot of sense from a business perspective. By serving the sentence now, while the appeal is pending, she gives certainty to her company - a certainty that would not have existed had she dragged out her confinement pending appeal." 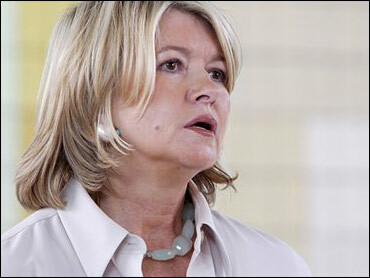 Stewart resigned as CEO of the company when she was indicted and gave up her seat on the board after she was convicted. She remains its leading creative force and holds the title of founding editorial director. A Manhattan federal judge had allowed Stewart to stay out of prison while she pursued an appeal, although lawyers said she faced an uphill fight. The same judge had twice rejected defense motions to overturn the conviction, first because a juror failed to disclose an arrest record and then after a government witness was charged with perjury. Her 10-month term was the minimum possible under federal sentencing guidelines. Stewart was convicted of lying about why she sold ImClone Systems Inc. stock in 2001. Prosecutors alleged that stock broker Peter Bacanovic tipped her off that her friend Sam Waksal was dumping shares of his biotechnology company. Waksal had advance word of a negative government report on an ImClone cancer drug. Stewart and Bacanovic maintained that she sold because they had a standing agreement to unload the stock when it fell to $60. Bacanovic was convicted and received the same 10-month sentence.